Title The Bailout Plan has stalled published to cocoa-touch. Stocks tumbled Monday afternoon on worries that the government's $700 billion bank bailout plan won't be sufficient to restore liquidity to nearly frozen credit markets. The frozen markets mean banks are hoarding cash, making it difficult for businesses and individuals to get much-needed loans. (Full story) Also in play: news that troubled Wachovia had to sell its banking assets to Citigroup as the financial market crisis raged. A number of European banks also collapsed. The Dow Jones industrial average (INDU) lost 290 points, or 2.6%, with under 3 hours left in the session. The Standard & Poor's 500 (SPX) index lost 4% and the Nasdaq composite (COMP) lost 4.6%. Stocks tumbled from the get go, on a mix of the stalled bailout plan, the Wachovia news and the impact of the clogged credit markets. Treasury prices rallied, sending yields lower, as investors sought safety in government debt. Investors are concerned that the government plan didn't go into effect even sooner and that passing the bill could be a more drawn-out process than anticipated as public sentiment remains negative. Investors are also concerned about how effective the plan will be, said Alan Gayle, senior investment strategist at RidgeWorth Investments. "We are charting new territory in policy tools and implementation with this program and there's no guarantee that it will work," Gayle said. Stocks tumbled from the get go, on a mix of the stalled bailout plan, the Wachovia news and the impact of the clogged credit markets. Treasury prices rallied, sending yields lower, as investors sought safety in government debt. 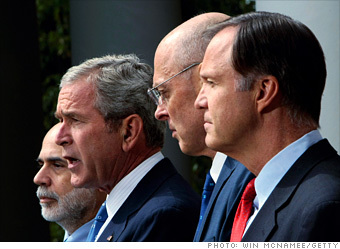 n Monday, President Bush and Federal Reserve Chairman Ben Bernanke praised the bill and urged Congress to pass it quickly. However, investors remained skittish amid more bank failures and banks continued to hoard cash. Meanwhile, the Federal Reserve and other central banks around the world announced steps Monday to make billions available to troubled banks. Wachovia: Citigroup is buying the company's bank assets in a $2.2 billion all-stock deal that will see the company hold onto its brokerage business and remain afloat, albeit in a smaller form. The deal calls for Citigroup to absorb up to $42 billion in losses and the Federal Deposit Insurance Corp. to be responsible beyond that. Citigroup will give the FDIC $12 billion in preferred stock and warrants in exchange. (Full story) Wachovia (WB, Fortune 500) shares plunged 90% in pre-market trading but did not open for regular trading. Citigroup (C, Fortune 500) fell 1%. Last week, JP Morgan Chase (JPM, Fortune 500) bought Washington Mutual (WM, Fortune 500), after it suffered the largest failure ever of a U.S. bank. On Monday, regional bank National City (NCC, Fortune 500) slumped 46% on worries that it might be next. Other regional banks dropped too. Bank of New York (BK, Fortune 500) fell 16%, Fifth Third Bancorp (FITB, Fortune 500) fell 23% and Regions Financial (RF, Fortune 500) fell 21%. Big banks fell too, including Goldman Sachs (GS, Fortune 500), Merrill Lynch (MER, Fortune 500) and Bank of America (BAC, Fortune 500). 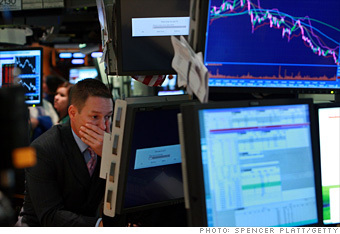 Global markets: Worldwide markets struggled. Asian markets tumbled and European markets were down in afternoon trading after three European banks fell apart. Dutch-Belgian bank and insurance giant Fortis was given a $16.4 billion lifeline to avoid it collapsing. The British government nationalized battered U.K. bank Bradford & Bingley. Germany's financial regulators and several banks stepped in Monday to throw a line of credit to Hypo Real Estate Holding AG in a multibillion-euro move aimed at shielding the No. 2 commercial property lender. Credit markets: Businesses depend on the credit markets to function on a daily basis, and the absence of ready capital has threatened to stall the broader financial system. 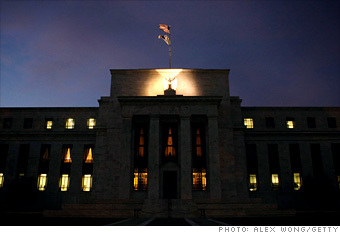 Several measures of bank fears surged Monday, suggesting that despite the bailout, banks remain worried. However, as with stock markets, the freezing up could be an immediate knee-jerk reaction that is mitigated once Congress passes the bill. Additionally, credit markets may have been more focused on Wachovia and the other distressed banks, than the bailout. The Libor-OIS spread, one gauge that banks use to determine lending rates, rose to a record 2.2%. Meanwhile, the TED spread rose to 3.12%, but was short of the 3.48% level it hit in the morning. That was the highest point since at least 1982. The TED spread is the difference between what banks charge each other to borrow for three months and what the the Treasury pays. When banks charge each other a higher premium than the U.S. government, that's a sign of fear. The three-month Treasury bill, seen as the safest place to park money in the short term, fell to 0.71% from 0.83% late Friday. It had been lower in the morning. 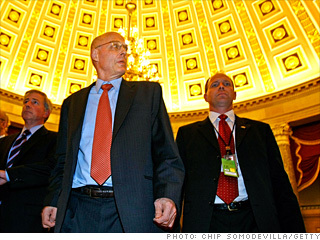 Earlier this month, the three-month bill fell to a 68-year low around 0% as panic gripped financial markets. Long-term Treasury prices rose, lowering the yield on the benchmark 10-year note to 3.69% from 3.82% late Friday. Treasury prices and yields move in opposite directions. Treasury prices have been rallying recently and yields tumbling as nervous stock market investors have looked for safer areas to move their cash. Other stock movers: Apple (AAPL, Fortune 500) slumped 13% after RBC and Morgan Stanley analysts downgraded the stock to "neutral" from "buy" saying the consumer spending slowdown will hurt profits. (Full story) A variety of other big tech stocks slumped, including Intel (INTC, Fortune 500), IBM (IBM, Fortune 500), Hewlett-Packard (HPQ, Fortune 500), Qualcomm (QCOM, Fortune 500), Cisco Systems (CSCO, Fortune 500), Dell (DELL, Fortune 500) and Applied Materials (AMAT, Fortune 500). Oil and gold: U.S. light crude oil for November delivery fell $8.14 to $98.75 as investors bet that a slowing global economy means oil demand will keep dropping. Oil prices had plummeted over $55 after peaking at $147.27 a barrel on July 11, as investors bet that sluggish global growth will diminish oil demand. But prices have seesawed in the last few weeks as the financial crisis has intensified and investors sought to put their money into hard assets. COMEX gold for December delivery rallied $9.50 to $898.00 an ounce. Like oil, gold prices had also rallied during the biggest periods of unrest over the last few weeks Other markets: In currency trading, the dollar gained against the euro and fell against the yen. Gas prices fell for the 12th day in a row, according to a nationwide survey of credit card activity.